Keeping data in two or more electronic devices up-to-date so that each repository contains the identical information. Data in handheld devices and laptops often require synchronization with the data in a desktop machine or server. All your Synced devices have up to date files so you can work from your laptop, Desktop or mobile device with the identical data. Data synchronization is the process of establishing consistency among data from a source to a target data storage and vice versa and the continuous harmonization of the data over time. 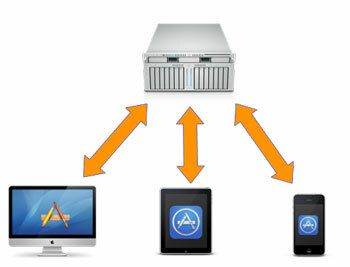 It is fundamental to a wide variety of applications, including file synchronization and mobile device synchronization.